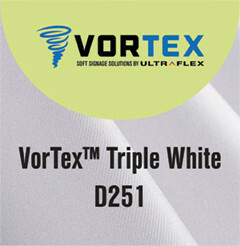 VorTex Triple White D251 has a tightly woven structure that produces a smooth print surface for notable print quality. Ideal for both front-lit and back-lit applications. Engineered for direct dye-sublimation, Latex and UV print processes. Perfect solution for SEG frame and pop-up display systems.